Home > Blog > Flashpoints > How Safe Are Dietary Supplements? The safety of dietary supplements has been a topic of discussion in the diabetes community for many years. Back in 2010 here at Diabetes Flashpoints, we discussed an incident in which human error resulted in a supplement containing up to 200 times the intended amount of selenium, leaving more than 200 people ill. Since then, the legal landscape around supplements has changed only slightly. So have things gotten any better? And how reliable are supplements overall? According to a recent study, supplement safety and reliability are still widespread problems. Presented last month at The Liver Meeting 2017 in Washington, DC (a convention of the American Association for the Study of Liver Diseases), the study analyzed the contents of herbal and dietary supplements by looking at the records of 2,268 patients enrolled in the Drug Induced Liver Injury Network between 2003 and early 2016. Overall, 341 supplements were collected, and out of these, the researchers performed chemical analysis of 229. As noted in a Healio article on the study, 26 of the analyzed supplements didn’t contain any ingredients on the label. Out of the 203 supplements that did list ingredients, only 90 (44%) were found to be labeled accurately. Mislabeling was especially common for steroidal ingredients, which were wrongly labeled 80% of the time, and in supplements marketed for bodybuilding (79% mislabeled) or weight loss (72% mislabeled). 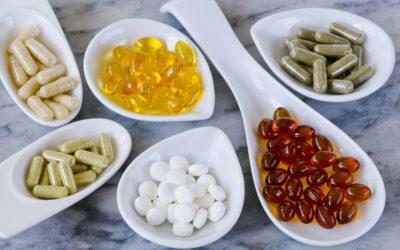 Supplements marketed for general health and well-being were wrongly labeled 51% of the time, and mislabeling was also somewhat common for vitamin ingredients (54%) and botanicals (48%). Out of all the supplements collected, the Drug Induced Liver Injury network considered 166 to be responsible for liver injury. The overall sample of supplements in the study was most definitely not random, so it’s impossible to know how its results translate into real-world risks associated with supplements. But because dietary supplements in the United States are not tested for safety or purity by the Food and Drug Administration (FDA), performing an analysis of the overall market would be close to impossible. One way to ensure that your dietary supplements are accurately labeled is to look for the USP Verified Mark on the product label. This seal indicates that the manufacturer has voluntarily agreed to oversight by the US Pharmacopeia (USP), an independent nonprofit organization. USP offers a list of its approved dietary supplements online. What’s your take on the latest study — are you worried about the safety and purity of dietary supplements? Do you take supplements, and if so, have you consulted your doctor about what you’re taking? Do you think the FDA should have greater oversight of dietary supplements, evaluating them for accurate contents — or possibly even safety and effectiveness, as it does with drugs? Leave a comment below!